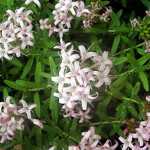 The flowers are generally around 3 cm in width, lilac to purple in colour or occasionally white. The stems and flower buds appear white as they are covered in fine hairs. 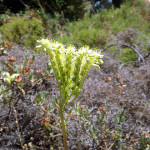 The leaves are narrow and spiny, with white markings. They can grow to around 80 cm in height. 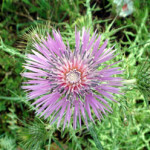 Found on uncultivated or barren ground, well-drained soils, pastures and roadsides. Distribution: SW and S of Europe, NW Africa. 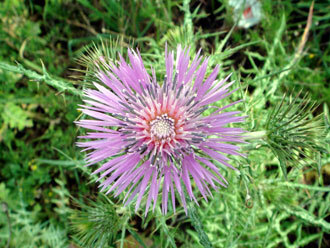 This is a robust, branched thistle which is usually wider at the base and can grow more than a metre tall. 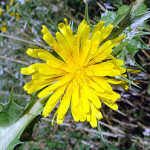 The yellow flowers are around 2–3 cm diameter. The new basal leaves are collected when in season as a wild vegetable. They are often cooked with scrambled eggs or with chickpeas in a stew and are locally called “Tagarninas”. This delicate looking annual campanula forms small mats of leaves, topped by purple flowers with a white centre and dark purple veining. It can be found in limestone rock crevices and in built walls. 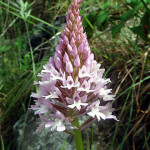 Although it can grow profusely around the village of Grazalema, it is very localised. 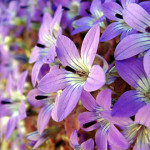 (Also known as Campanula lusitanica subsp. specularioides) Distribution: Sierra de Grazalema and Serranía de Ronda. 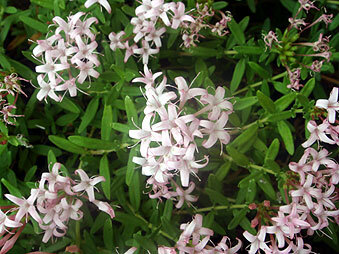 This is a perennial, evergreen plant which can grow in the most inhospitable areas, including baking hot clay roof tiles. They store moisture in the small plump leaves which are bronze / green in colour. 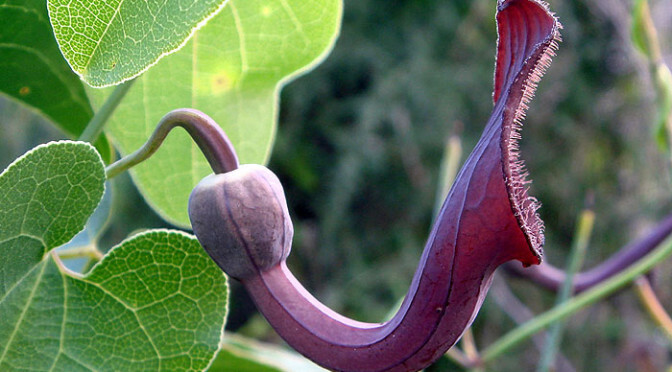 It can reach a height of around 50cm when in flower. 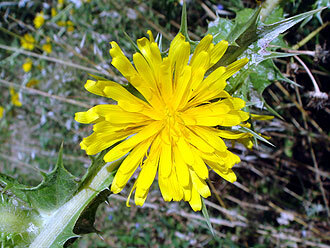 Each upright stem is topped by a radial spray of small yellow flowers of 5 petals. 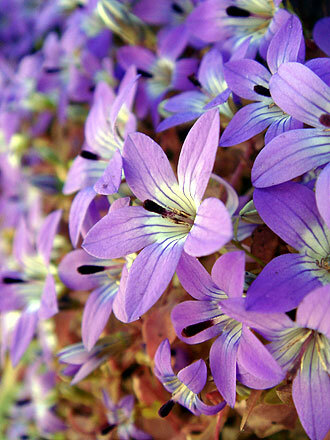 Can be seen in arid rocky areas, rock crevices, in dry-stone walls and rooftops. This is a low growing, spreading evergreen, which is woody at the base and forms a dense mat. During the summer it is covered in tight clusters of delicate, pink tubular flowers, which are very popular with butterflies and bees. The flowers are followed by red berries, and they can occasionally be seen bearing both. Found on vertical limestone cliffs, rocky areas and slopes. Distribution: Mediterranean area. 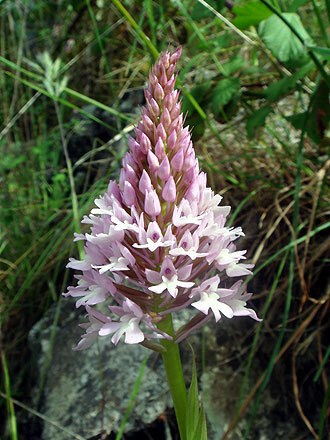 An elegant orchid smothered in pink flowers which are densely arranged in a cone shape on the flowering scape. 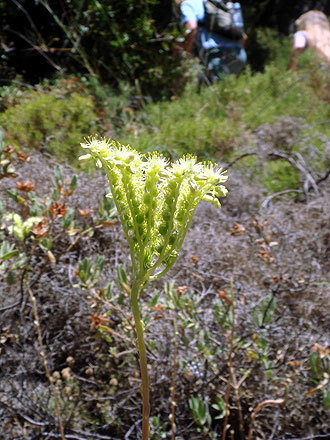 May reach 30cm in height and can be seen in meadows and rocky exposed slopes. Unlike the bee-orchid group, these are pollinated by butterflies and moths. Distribution: Central and Southern Europe, Mediterranean region.